Writing a novel was not a part of his life plan, he just happened to be inspired by a few small boxes of letters he discovered as the executor of his late aunt’s estate. What he discovered in those boxes inspired him to give voice to the now-departed lovers who had written them, his late aunt and uncle. Happy Living Books Independent Publishing is pleased to announce it’s latest book release. 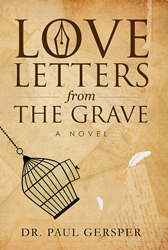 Love Letters from the Grave is an inspiring novel that reveals the mystery of how two 40-year olds came to act like starry-eyed teenagers, who fell hopelessly in love; causing them to throw caution to the wind, and speed hell-bent toward an uncertain future. It is now available for Pre-order exclusively at Amazon.com, and will be officially released on December 21, 2016. After reading more than one hundred love letters discovered as the executor of his late aunt’s estate, Dr. Paul Gersper was entranced. It was such a tender love story that he felt it had to be shared with others, and so he spent the next five years writing it.